In honor of the Diamond Jubilee celebration, Basic Grey Challenge and Simon Says Stamp Challenge have both selected that theme for their current challenges. We were challenged to use things such as crowns, royalty, and bling in our creations. I used a very simple layout, as I knew that with the large image, most of the background paper would be covered. I colored my images using Copics and then cut out Tilda and popped her up on foam tape for more dimension. The largest flower originally was a white Prima flower. I dyed it a long time ago and added a bunch of glitter to it. That flower didn't work on the project I intended to use it on, but I was glad that I had it for this card! I know that I used one of my SU! pinks to die it, but I don't know the exact color I used. Papers: white, green, dps from Basic Grey "Sultry"
I'm working on using up the last of my Basic Grey "Sultry" paper pad. There will be more cards coming in the near future! 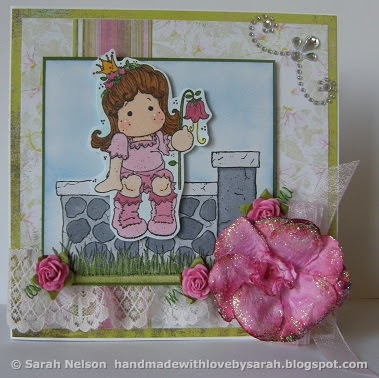 A gorgeous card Sarah, a great design and a beautiful sparkly flower........Tilda is adorable perched on her wall.